MA student Kevin Schreck demonstrates different ways of instructing grammatical concepts in the Current Practices and Research in Teaching Spanish course. 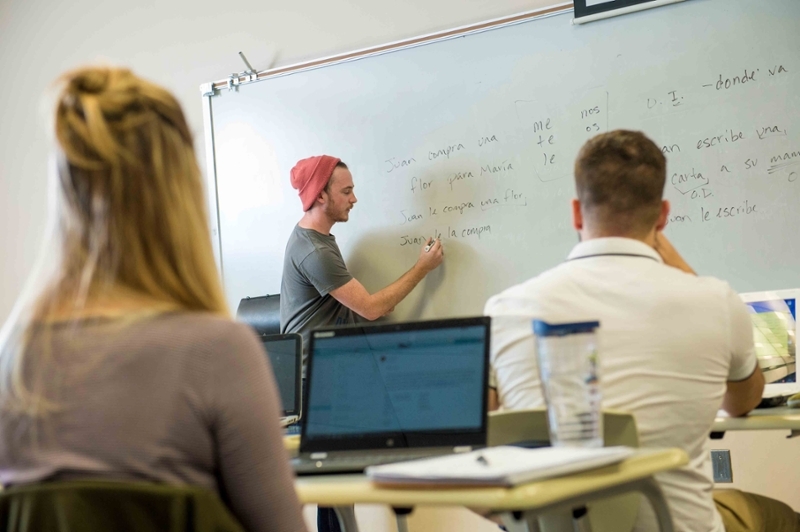 The Graduate Program in Spanish at UNCW empowers students with opportunities to take courses in Hispanic linguistics, literature, film studies, history, culture, and pedagogy, among other topics, taught by faculty who are active researchers in their fields. Furthermore, students can pursue more detailed projects through funded field research, independent study opportunities, and theses. Many of our graduate courses in Spanish are taught in the evening which allows us to serve traditional as well as non-traditional students. What is it about Don Quijote that makes it the second-most translated book in the world (after the Bible), and why is it regularly cited by Nobel Prize winners as the literary work that has most influenced their lives? In this course, students will go beyond the stereotypes of a mad night and loyal squire to explore in depth the literary world inhabited by Don Quijote and Sancho Panza, which is populated by galley slaves, outlaws, prostitutes, noblemen, wizards, armies of sheep, and magical caves. In addition, students will examine the social, religious, political, and cultural realities of the 17th-century Mediterranean basin that deeply influenced Miguel de Cervantes Saavedra’s life and, more importantly, his masterpiece. *This course features distance delivery for students who are not in the Wilmington area This is a survey of major works of Argentine literature and film relating to the political, social and cultural developments that have defined the nation since independence. After studying nineteen-century authors that articulate contrasting visions for the future of the country, students will explore how the original dichotomies dividing Argentina are rekindled in the twentieth-century. As we will corroborate, escalating ideological tensions may also be discerned in the clashing depictions of historical figures that would soon achieve mythical status: Juan Domingo Perón, Eva Duarte, and Ernesto “Che” Guevara. Still tracing deep seethed political divisions, the last part of the course will attempt to explain the origins of the radical violence that culminated in the most recent dictatorship (1976-1983), and the chain of events that led to the absurd Malvinas experience. As we progress throughout the semester, we will also treat ourselves to several works by Jorge Luis Borges, who rewrites nineteenth-century literature, but also comments on controversial twentieth-century figures and events. This course, taught in Spanish, will investigate representative films from Latin America that focus on violence and poverty. We will review critical historical periods in Latin-America through their representation in films from the 50’s to our current days. We will discuss the link between violence and poverty, otherness, memory, mourning, healing, as well as other topics, employing critical texts to explore the complex relationship between film and historical, political, cultural, aesthetical and theoretical questions. The course will include movies from Argentina, Brazil, Colombia, Cuba, Chile, México, Perú or Venezuela and features well-known directors such Luis Buñuel, Fernando Meirelles, Claudia Llosa, or Barbet Schroeder, among others. This is a seminar in which students will have the opportunity to research theories and practices for teaching Spanish in a variety of bilingual environments. These include teaching Spanish to heritage speakers and to mixed classes at the secondary and post-secondary level as well as dual-immersion in elementary schools. Mexico can be identified by its territory, borders, constitution, and institutions. However, the definition of both personal and shared identity and what constitutes lo mexicano is a much more polemical and contested matter. In this course we will explore the idea of identity in Mexico through the analysis of works where Mexicans from today and the past engage in these very questions. Students will explore a variety of texts including historical and philosophical writings, literature, film, popular music, fine arts, street art, theater, and television. Through these varying perspectives we will delve into how economics, politics, religion, gender, sexuality, ethnicity, language, historical and cultural memory, borders, migration, and ecology filter and inform the always provisional and disputed idea of lo mexicano. Este curso sigue una trayectoria representativa de la novela española, desde los finales del siglo XIX hasta hoy día, enfocándose en su potencial como forma de crítica social. Analizaremos su relación con temas tales como la identidad y el género sexual, la injusticia social, la violencia, la modernidad, el poder estatal y el consumismo. Algunas de las preguntas que el curso examinará incluyen: ¿Qué estrategias emplea la novela para emprender una crítica social? ¿Cómo negocia la novela el espacio entre la sociedad ‘real’ y su mundo ficticio? ¿Existe una relación ética entre el autor, el texto y el público lector? ¿Está obligada la novela a ser responsable con respecto a las normas de la sociedad? General course descriptions can be found in the UNCW Academic Catalogue.